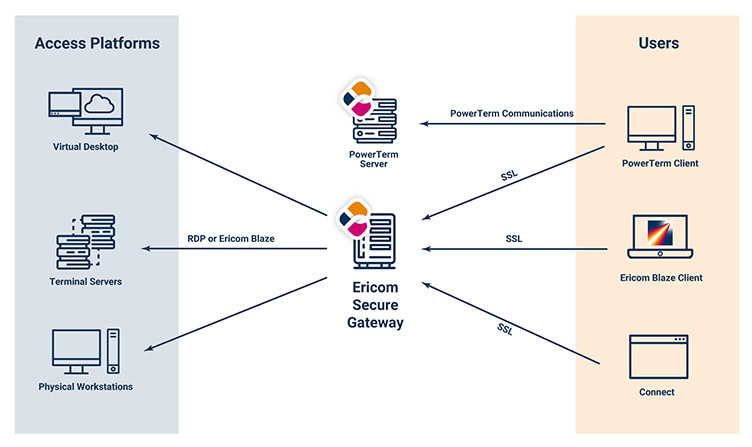 Ericom's scalable, high performance SSL Gateway secures the access to your business-critical internal resources running on RDP hosts (virtual desktops, Terminal Servers, etc.) from unsecured locations outside the firewall (e.g., the Internet) without requiring an SSL / IPSec VPN. Built-in security whitelisting of trusted end user devices and servers. Ericom Secure Gateway acts as a gateway between end users in remote locations and Windows applications and desktops in the datacenter. It may be installed in a DMZ to route traffic between the Internet and the LAN. Download the Free Ericom Secure Gateway Now!